Download "CALIFORNIA STATE UNIVERSITY DOMINGUEZ HILLS"
1 1 CALIFORNIA STATE UNIVERSITY DOMINGUEZ HILLS PSY SPORT PSYCHOLOGY 3 Semester Credits Online Prerequisites: PSY 314 or PSY 340; or consent of instructor. Psychological principles and research in motivation, psychophysiology, personality, cognition, development, emotion and group behavior applied to sport settings. 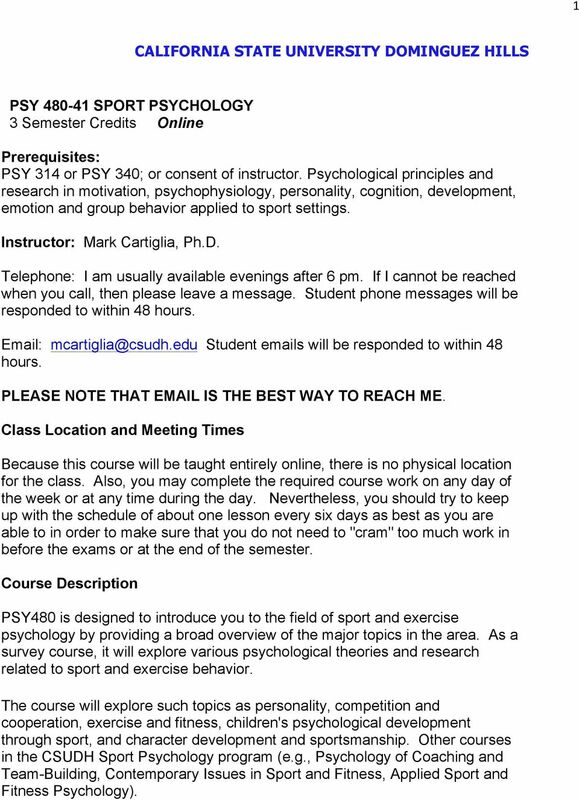 Instructor: Mark Cartiglia, Ph.D. Telephone: I am usually available evenings after 6 pm. If I cannot be reached when you call, then please leave a message. Student phone messages will be responded to within 48 hours. Student s will be responded to within 48 hours. PLEASE NOTE THAT IS THE BEST WAY TO REACH ME. Class Location and Meeting Times Because this course will be taught entirely online, there is no physical location for the class. Also, you may complete the required course work on any day of the week or at any time during the day. Nevertheless, you should try to keep up with the schedule of about one lesson every six days as best as you are able to in order to make sure that you do not need to "cram" too much work in before the exams or at the end of the semester. Course Description PSY480 is designed to introduce you to the field of sport and exercise psychology by providing a broad overview of the major topics in the area. As a survey course, it will explore various psychological theories and research related to sport and exercise behavior. The course will explore such topics as personality, competition and cooperation, exercise and fitness, children's psychological development through sport, and character development and sportsmanship. 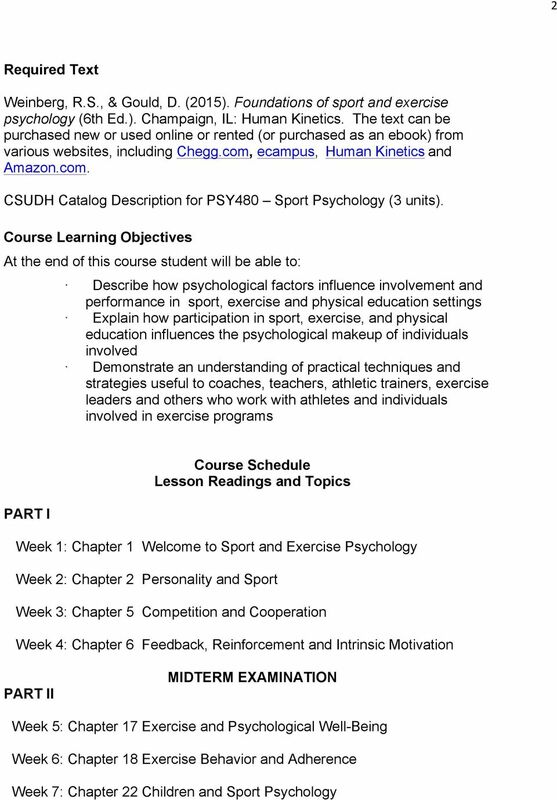 Other courses in the CSUDH Sport Psychology program (e.g., Psychology of Coaching and Team-Building, Contemporary Issues in Sport and Fitness, Applied Sport and Fitness Psychology). 3 3 Week 8: Chapter 24 Character Development and Good Sporting Behavior Course Requirements FINAL EXAMINATION Readings The course is divided into 8 Lessons (click on the Course Material tab to view the Lessons). Each Lesson covers a specific chapter in the Weinberg and Gould textbook. You are expected to keep up with the reading (about one chapter every six days), in order to finish the course on time (See the Course Schedule on page 4 of this Syllabus and by clicking on the Course Material tab.). Each Lesson has a.ppt presentation covering a specific chapter in the Weinberg and Gould textbook in addition to the.ppt lecture slides for that chapter. In order to view the lecture slides you will need a PowerPoint viewer (Microsoft PowerPoint Viewer), which you can download free from the Microsoft web site. You will be tested on the material covered in the textbook and in the.ppt presentations. The course is divided into two parts. Part I covers the first four Lessons (Lessons 1-4), and Part II covers the next four Lessons (Lessons 5-8). 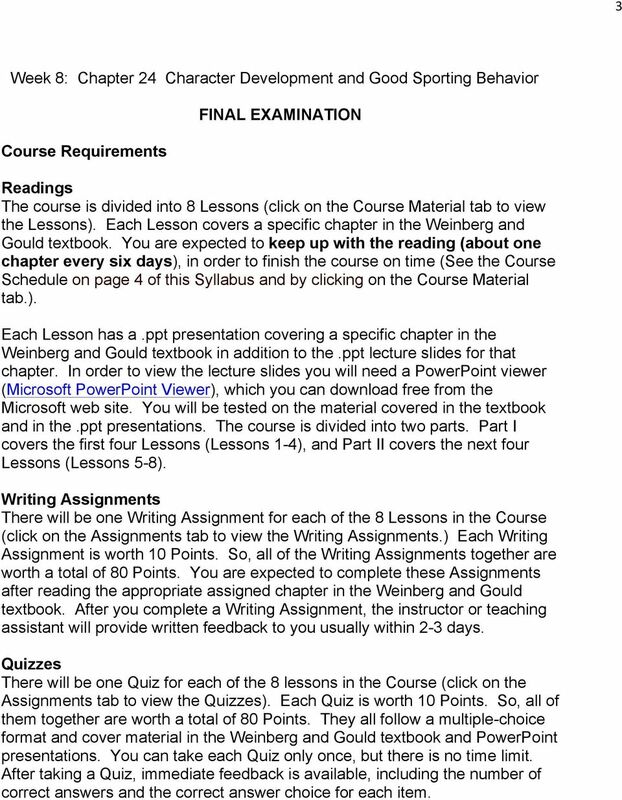 Writing Assignments There will be one Writing Assignment for each of the 8 Lessons in the Course (click on the Assignments tab to view the Writing Assignments.) Each Writing Assignment is worth 10 Points. So, all of the Writing Assignments together are worth a total of 80 Points. You are expected to complete these Assignments after reading the appropriate assigned chapter in the Weinberg and Gould textbook. After you complete a Writing Assignment, the instructor or teaching assistant will provide written feedback to you usually within 2-3 days. Quizzes There will be one Quiz for each of the 8 lessons in the Course (click on the Assignments tab to view the Quizzes). Each Quiz is worth 10 Points. So, all of them together are worth a total of 80 Points. They all follow a multiple-choice format and cover material in the Weinberg and Gould textbook and PowerPoint presentations. You can take each Quiz only once, but there is no time limit. After taking a Quiz, immediate feedback is available, including the number of correct answers and the correct answer choice for each item. 4 4 Exams There will be a Midterm Exam and a Final Exam in this course. Each Exam will be posted to the Assignments folder the morning of the first day the Exam is available. You will take the Midterm Exam after completing ALL of the Writing Assignments and Quizzes in Part I of the course (Lessons 1 through 4). 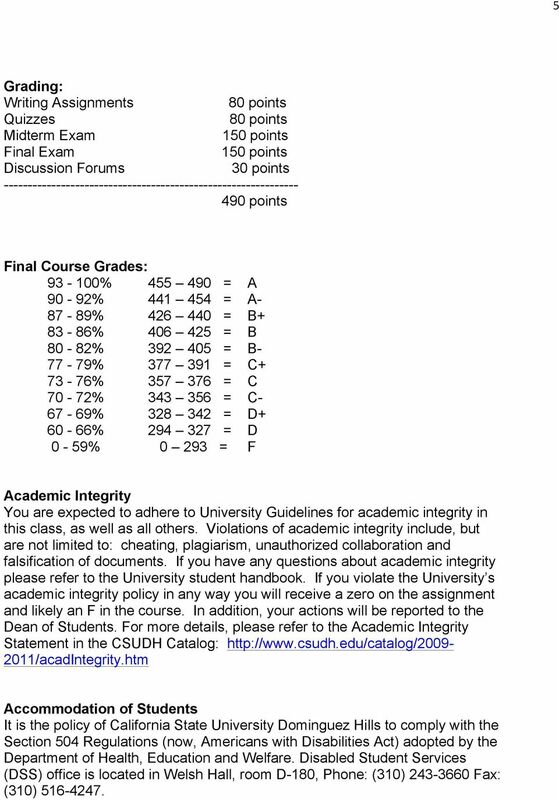 The Midterm is worth 150 Points. You will take the Final exam after completing ALL of the Writing Assignments and Quizzes in Part II of the course (Lessons 5-8). The Final is worth 150 Points. Both the Midterm and Final will consist entirely of multiple-choice items. You are advised to take each of these Exams on a day when you have a block of uninterrupted time because, unlike the Quizzes and Writing Assignments; there will be a time limit for the Exams. You must complete the Midterm Exam within a 3-hour time period and the Final Exam within a 3-hour time period. Once you open an Exam, the clock starts and you must finish it within the time limit. Discussion Forums There will be a total of 6 Discussion Forums in this course (available by clicking on the Discussion Board tab). Through these Forums, you will be able to answer discussion questions posted by your instructor and interact with one another. The Forums have dates attached to them. You are expected to participate in each Forum within the designated time period for that particular Forum. You will earn 5 points for participating in each Forum. Keep in mind that if you participate after the end of the designated time period, you will earn no points for that Forum. All of the Forums together are worth a total of 30 Points. 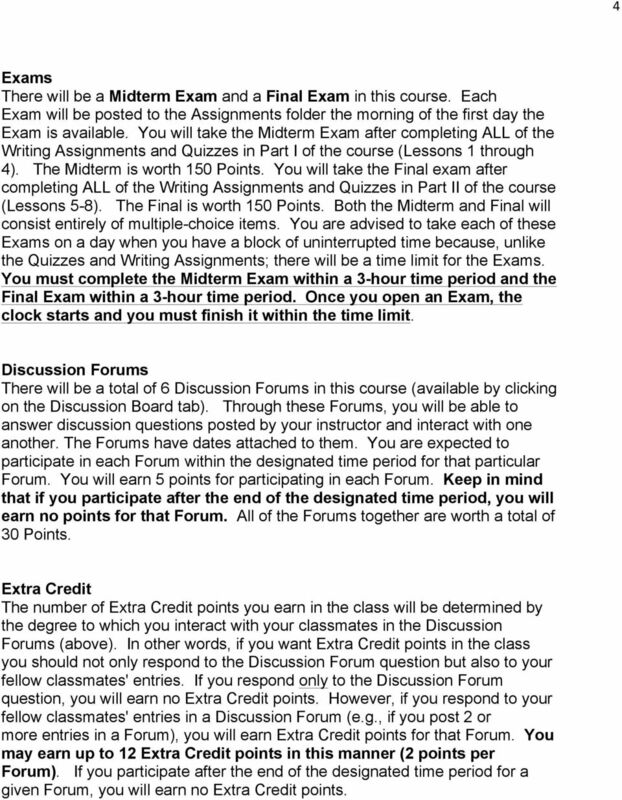 Extra Credit The number of Extra Credit points you earn in the class will be determined by the degree to which you interact with your classmates in the Discussion Forums (above). In other words, if you want Extra Credit points in the class you should not only respond to the Discussion Forum question but also to your fellow classmates' entries. If you respond only to the Discussion Forum question, you will earn no Extra Credit points. However, if you respond to your fellow classmates' entries in a Discussion Forum (e.g., if you post 2 or more entries in a Forum), you will earn Extra Credit points for that Forum. You may earn up to 12 Extra Credit points in this manner (2 points per Forum). If you participate after the end of the designated time period for a given Forum, you will earn no Extra Credit points. 6 6 Course Evaluations Course evaluations and program surveys are important components of the educational process. All courses taught through Extended Education are evaluated. Students are strongly encouraged to complete the electronic course evaluation form (Perceived Teaching Effectiveness) that will be available during the last two weeks of the course. An notification is sent to students via their toromail accounts indicating the availability of the online evaluation form two week before the course ends. The evaluation is anonymous. COURSE DESCRIPTION An in-depth study of United States military history in the 20th century. Prerequisites There are no prerequisites for this course. However, introductory coursework in exercise science or psychology may be beneficial. Psychology and the Media COURSE TITLE PSY3245 COURSE NUMBER NUMBER OF CREDITS. Dr. Laura J. Moore INSTRUCTOR. laura.moore@purchase.